I was sent an ARC of this by a friend of mine on LibraryThing who spotted it on my wishlist. She wasn’t overly impressed with it, but I adore books about books and so I thought I’d give it a go. Ms. Sankovitch has a background in Law, but her writing ability would easily lead you to believe she had years of literary training under her belt. Her prose is beautiful from beginning to end and the images she creates of her childhood holidays and her parents’ wartime experiences seem to jump off the page. The most memorable aspect is Ms. Sankovitch’s grief over the death of her sister. I have never read such moving descriptions of a lost relative as in this book. Anne-Marie was clearly a beloved sister and that is never forgotten here. Nina’s words really convey the depth of her loss. It’s not really as ‘book-ish’ as I’d have expected, considering the basic premise of the book. It’s more of a jumpy autobiography, using snippets of book plots to prompt various memories from the author’s life. She relates her own experiences to literary ones and theoretically learns how to deal with her own feelings based on those in novels. I particularly liked the list of the 365 books read in the back. There are some interesting titles there, including some I’ve added to my own wishlist. They’re not the usual type of books I read, so it’s broadened my scope a little bit and I can’t wait to get my hands on some of those titles. I have to admit though, the concept doesn’t make much sense to me. Surely a better way to deal with your grief is to face up and deal with your issues, not hide your head in the sand (or a book) and pretend they don’t exist? Her husband goes to bed alone every night because she’s too busy reading and her children beg for attention. She completely ignores the real world in favour of reading. Trust me, I know it’s an appealing idea sometimes but it comes across as very, very selfish. ‘I had to bring back joy enough to reignite belief in my children that the world is not about death and that living is not about waiting to die. Uhh… what? If you want to reassure your children that life is worth living and that death isn’t to be feared, crazy idea and all, but why not talk to them!? This paragraph irritated me beyond all belief. Hiding away does not help your children deal with death. If anything it teaches them that ignoring their problems (and their family) makes them go away. 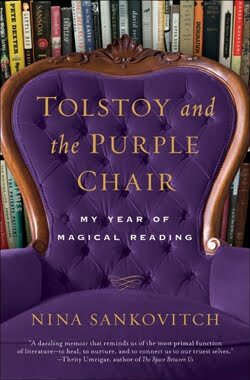 On Thanksgiving, Ms Sankovitch reads a 376 page book instead of bothering to enjoy the festivities with her family. Boy, I sure wish I could be as festive and jolly as her during the holidays. It also annoyed me that she constantly refers to her challenge as ‘work.’ No, dear. ‘Work’ is what your husband does to support you and your four children because you’ve decided you’d rather read all day instead of contributing to the household income. I’ve come across as quite snarky in this review, and I didn’t mean to because I genuinely enjoyed living through the author’s memories and bookish musings. However – we all use reading to escape from our problems, whether it’s grief, illness, relationship issues… we do. But we don’t call it dealing because it’s not. This is the third review of this book I've read this week! I reallllly want to read it, just to see how I feel about it, as so far, one hated it, one really loved it, and the third is you! I do think that the idea of somebody reading as their 'job', without getting paid for it, and expecting other people to view it on a parallel with a 'real' job is a bit weird. I know that some people think that reading loads and voluntarily writing about it in my spare time is a bit mental, but I do actually do other things as well… Hmmmmm, I think I'll definitely have to get my hands on a copy! That's exactly it! She expects everybody to view it on the same level as a real job. Like, she thinks her husband's selfish when he suggests that maybe she could actually get some washing done while she's at home. Arrrrrgh. Looking for the writer who listens to your writing demands?.impressive stuff .